Here at Park Shoe Repair we spend our days sewing, cutting, stitching, patching, sanding, replacing soles and heels, polishing or simply adding a hole to a belt. 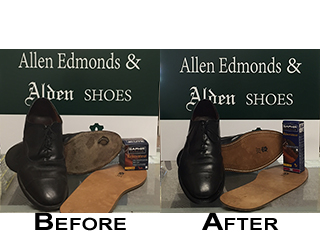 If the sole of your shoe is wore out, we'll replace it. Need new heels on your shoes we are here for that too. At Park Shoe Repair we pride ourselves on using quality materials, combined with excellent craftsmanship, while keeping the cost as low and competitive as possible. As always your satisfaction is our number 1 goal.